Are you wondering if your Shiba has the ability, capacity or desire to participate in nose work? K9 Nose Work© created by the National Association of Canine Scent Work (NACSW™), is a detection style game where dogs learn to get excited about using their nose to seek out a favorite toy or treat reward placed in one of several boxes. Your Shiba will benefit from the way the game of K9 Nose Work© is designed from the beginning to give the dog the choice and independence to hunt for a primary reward. We start with a primary reward to build drive and the desire to hunt with all types of dogs no matter their physical abilities, ages or level of training. The great thing about starting nose work as a game is that it provides the most flexibility for all levels of dog owners no matter their dog’s sport background. Each dog and handler progresses at their own pace as the dog solves puzzles and learns their own way, best for each dog; fast, slow, blind, deaf, old, young or retired champion. Every description of the Shiba breed includes the words "independent". The game is well suited for this trait and as I discovered with my Shibas, once exposed to the fun and independent nature of hunting in nose work, they were much more willing to work with me in other training situations. It’s been a great compliment to the Shiba’s hunting desire in a controlled environment and they have thanked me for it with a stronger bond and wonderful relationship. As each dog grows more confident with the puzzles, the game expands to entire rooms, exterior areas and vehicles. The challenges can grow to resemble much more of the detection style searching and for those interested in training more advanced skills; target odors (birch, anise, etc) are added to the search, and much more! Competition is available for teams that enjoy the challenges and opportunities to Title under the NACSW™. Starting with just a few boxes, an inexpensive piece of equipment, my Shiba, Atlas, searched for his treats placed in the boxes. It expanded the searching for treats with more boxes, folded into puzzles, mazes, stacked, hidden, nested, scattered, in every imaginable way. Other objects were added too, like cones, chairs, tables, carts and bins of all sorts. Then the boxes went with us, searching these puzzles in training rooms, garages, houses, parks, backyards, barns, and fields. The nose work game is only limited by your imagination. If you need some ideas on how the game starts and where it can go, check out the Parker Videos. Part of the fun is thinking up new searches for all teams, it’s an interactive game for both dog and handlers. I started with a particularly challenging Shiba, a resource guarder, sensitive about his space, super high energy and when he became an adolescent I was not very successful training him to have good manners. He got plenty of exercise but the physical exercise lacked mental stimulation. K9 Nose work© changed that and gave him a job to do. Instead of letting the Shiba intelligence free to devise all manner of ways to play their games, many times at our expense, put those Shiba skills to work. Nose work provided a wealth of puzzles for him to solve and exhausted his energy faster than any 10 mile hike. Motivation via food worked in my favor, but it was the desire and instinct to hunt, seek and problem solve in the nose work environment that saved him. It was extremely rewarding for me to see him hunt happily every time the boxes appeared. The best part was giving him the freedom to choose his own path and for me to learn by watching him work out all the puzzles. K9 Nose work© became my passion because of the wonderful changes in the relationship with my Shiba Inu. The sport of Nose Work had just started growing across the country in 2011 when I started playing the game with my Shiba, Atlas. I had no plans to compete, no desire and no idea what to expect. After about 9 months of having fun, I had advanced to working with the first target odor: Birch (an essential oil on several q-tips in a small tin container). I drove 16 hours (one way) to attend my first Odor Recognition Test (ORT), a requirement to compete in a trial. This is a test which consists of 12 identical boxes normally in 2 rows where one box has the target odor placed inside. The challenge of the ORT is to test if the dog recognizes the odor in a box and then can the handler recognize their dog working the odor to call "Alert" on the correct box. I had never competed with a dog and was very nervous. With my novice skills reading my dog’s communication working the birch odor, Atlas and I, missed, when I called "Alert" on the wrong box. It was disappointing but just seeing him navigate the environment and hunt was enough for me to be hooked on the sport. I now compete with all three of my Shibas; each has a different search style. 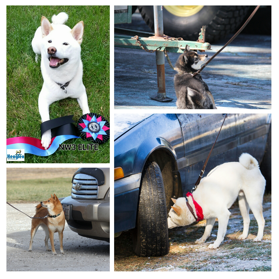 Of course, they have Shiba similarities but each is an individual and part of the fun is learning how to grow my skills as a handler and be the best teammate possible when competing in nose work. The NACSW™ sanctions K9 Nose Work© Trials that come in two forms: NW1, NW2 and NW3 were rolled out first, Element Specialty Trial (EST) are new since 2014. Once a dog has passed the ORT for the first odor, birch, that dog can be entered into an NW1 trial to find one placed birch hide (hidden from handler view) in four different search areas: containers, interiors, exteriors and vehicles. The dog must subsequently pass an anise ORT and have titled at NW1 to compete in NW2, and must pass a clove ORT and have titled at NW2 to compete in NW3. Element Specialty trials are half day events where one element is searched: either containers, interiors, exteriors or vehicles. Normally there are at least 4 search areas per half day trial of one element, so each team will search 4 container search areas for the opportunity to title in a Level 1 Container trial, or 4 interiors search areas for a Level 1 Interior trial. For all Level 1 Element Specialty Trials, there will be 1 hide per search area. Element Specialty Trials get more challenging at Level 2 and Level 3 with multiple hides, additional odors, and intentionally placed distractions. For a dog to title at a NW1 trial they must located one hide in each search area and the handler must call "Alert" correctly for the judge to approve. If the team correctly finds the 4 hides then the dog earns an NW1 Title. For NW3 the biggest added complication to the trial level is that it will not be known to the handler whether there are 1, 2, or 3 hides in each search area. This increases the challenge to each team significantly. The handler must be able to read when their dog has found all the hides in each search area. The handler finds out at the end of the trial if they have successfully found all of the hides that day and if so receives an NW3 Title. Video examples of NW1 and NW2 are available via the NACSW™ website. If a dog can successfully pass 3 different NW3 trials receiving a title then they achieves a NW3 Elite Title. As the NACSW™ organization continues to grow they have added additional trial opportunities. The newest is the Elite Division trials, where all teams need to have achieved the NW3 Elite Title level in-order to trial. The new Elite Division trials no longer have predefined search elements, so an exterior type search may include containers or vehicles. Or an interior type search might include vehicles. In addition there is no longer requirements on the number of hides and the number could be disclosed or not before the search. This new Elite Division level gets very close to real world type of search environments that professional detection handlers might encounter; show up and work a location with many unknowns. There are additional nuances about trialing including faults, distracters, and limits on hide elevation so if you are looking for more specific trial rules and information check out the NACSW™ website. Opportunities to participate in an ORT and Trials are far more available now. As of 2015 the sport has exploded across the country with trials, instructors, camps, seminars, the NACSW™ National Invitational, and many enthusiastic nose work teams in many states. There will be 31 states in 2015 that will have hosted K9 Nose Work© trial. As of 2015 the UKC is sanctioning nose work competitions. The UKC nosework competition has its own set of rules and challenges, providing an additional opportunity to participate in nose work. There are also several other organizations that have created scent work games each with their own challenges. Atlas achieved his NW3 Elite title in July 2015 having successfully titled at three NW3 Trials, becoming the first Shiba to accomplish this and becoming one of about 100 NW3 Elite title holders from NACSW™ trials around the country. It was a 4 year journey! Since the sport was just starting in my region I traveled all over the country to trial in 15 different states, making the journey very rewarding, including the opportunity to meet so many nose work enthusiasts. I’ll steal a comment from a fellow Shiba handler when they told me it is a big accomplishment to title a Shiba in any sport. And its great to see a number of Shiba teams around the country competing in nose work at many levels including NW3. It has been a great experience to meet so many teams, cheer their success and appreciate the great determination and training it takes to compete with a Shiba Inu. Many of the nose work searches I set for my Shibas aren't about competition. I play the game for fun, giving all my dogs puzzles to engage their minds. K9 Nose work© is a great way to have fun with your dogs!